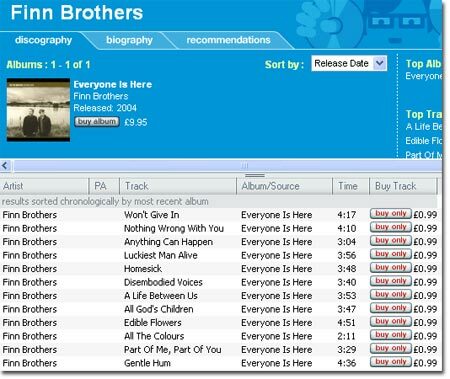 I signed up as a subscriber to Napster when they launched in the UK in May 2004, and have been paying £9.99 a month to be able to stream* any of the million tracks available. *I don't actually buy any albums as I have an uncanny ability to accurately memorise any music track I hear on my PC and replay it from my memory at any later date. 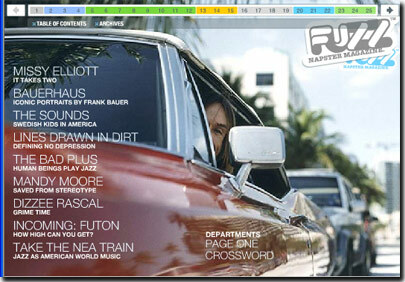 Naspter produced a magazine called FUZZ that was accessed via a tab on the Napster application. FUZZ is a flash magazine that contains inteviews with various musicians. After a couple of months I was a bit annoyed to notice a new issue of the magazine had not been published. Other people also commented on the lack of new issues on the napster message boards. The same issue of FUZZ was still available on the Napster application yesterday, whick makes it eight months old. I have just downloaded a new version of the Napster application that has dropped the magazine tab completely. But being the half-assed company they are they have forgotton to remove the Magazine tab from their tutorial. I decided to investigate further and managed to sniff out the url of the magazine http://home.gb.napster.com/magazine/issue01/index.html. Now "issue01" implied that there were more issues and lo and behold that was the case: FUZZ Issue 02, and FUZZ Issue 03. But why hadn't these the issues appeared in Napster? After investigating the message boards I found that people were reporting seeing different magazines on different PCs. The only explanation I can think of is that the url of the magazine was somehow hard-coded into the application so you only saw a newer edition of the magazine when you installed a new version of the application on a different machine. After looking at the American version I could see that the articles were the same as the ones in the UK version but in a different order. I am assuming that US Napster has also removed the Magazine tab from their application and that Napster have given up on publishing the magazine. But I womder of they dumped the magazine because of the low numbers on their weblogs? Did Napster even realise that very few people were ever seeing the new versions of their magazine? Anyway for all of you music fans out there, here are the links to the UK and US magazine archive pages. David Allen Elsensohn went to a lot of trouble to put these together and it's only fair that they get a wider audience. Who knows, we may even see a new issue one day! 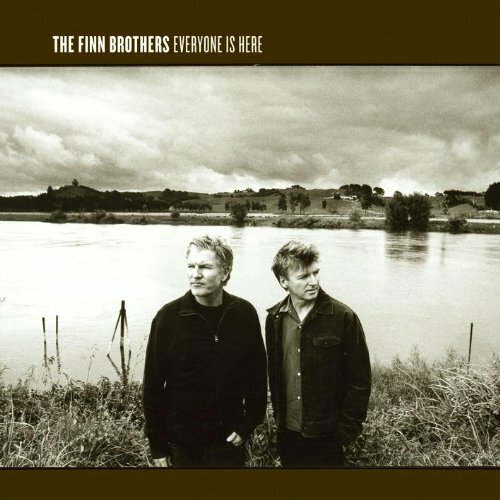 "Everyone Is Here" the new album from the Finn Brothers was released today. "All things considered, a bit of a classic." (The Guardian). I've loved their songs ever since Split Enz, so I had been looking forward to this album ever since I heard about it. 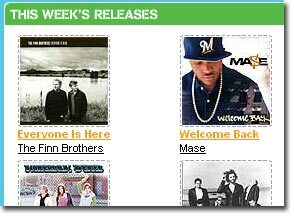 I just got my weekly email from Napster telling me that the album was one of this weeks featured releases. Was my confidence in Napster about to be upgraded? Would the legal download experience finally exceed my expectations? No, it bleedin wouldn't! Chris and Brad have managed to let me down again. I pay my £9.99 a month to be able to listen to their vast music library, only to be informed that this particular album, the one I want to listen to as soon as it is released has been relegated to the "Buy Only" category. This means that I cannot listen to it, unless I pay another £9.99 to Chris and Brad. They will let me listen to the first 30 seconds of each track, but even the Geneva Convention would class that as torture. So what am I to do now? There is no way that I am going to pay the Fiddle Brothers (Chris and Brad, not Neil and Tim) any more of my hard earned cash. I could wait until Crapster take this album off the "Buy Only" list, but that could be weeks, months or never. I could go to Tesco's and pay £11.24 for the album, which would take me about 45 minutes. I could order it from Amazon for £8.99 (plus postage and packaging) and get it in a day or two. Or I could look for a BitTorrent seed for the album, download it to my PC, burn an audio CD and listen to it while I do the washing up. This would take about 15 minutes (that's for the first part, it would take me a lot longer to do the washing up because I do it properly. Mechanical dish washers just steam the plates in a bacteria filled fug you know). I remember when they told me that home taping was killing music. Well, if the so called music industry don't pull their socks up and make sure that the experience of buying music legally is not vastly superior to the experience of p2p sharing, then they should consider adopting this logo for their next campaign. Chris and Brad are trying to get people used to the idea of downloading music legally, but if they can't provide a good enough experience then they will be encouraging their customers to go to a download service that delivers the goods, and that maybe a p2p mechanism like BitTorrent rather than iTunes or Real. 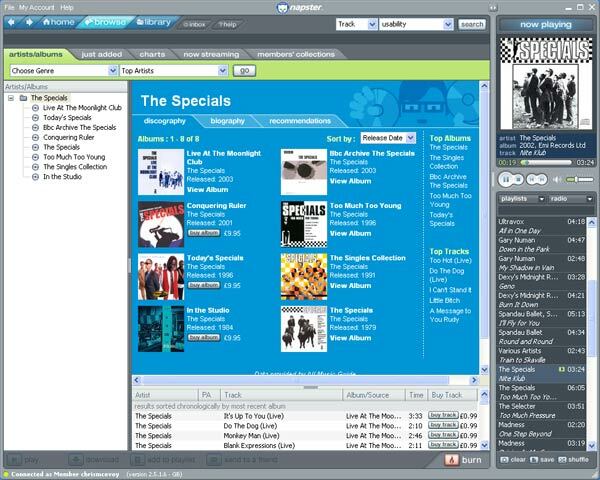 I have been using the UK Napster service since it launched in May 2004 and have stopped using Wippit and MSN Music Club(OD2) as the Napster Experience is vastly superior to the OD2 offerings which appear to have been designed by Dilberts who may know their technology, but have never heard of usability. However as time has gone by, I get the impression that the Napster UK colony is not taken too seriously by Chris and Brad, despite what Leanne Sharman has to say. "Napster is a fantastic brand to launch in the UK and by carefully tailoring the service to the local market we have an unparalleled proposition for UK music fans," said Napster UK general manager Leanne Sharman. Whilst Napster may know a little about usability they obviously aren't aware of the usability issues around internationalisation. I am currently paying £10 (which don't come for free!) a month for Napster and I just want to be treated as a 1st Class Customer instead of feeling like somone who's being taken for a bit of a ride. In the US people are being offered a free mp3 player if they sign up for a year. When will I get the same offer? The prices for buying songs are too high at (99p a song) so I just stick to the streaming jukebox and radio stations. If Chris and Brad want to treat me as an American then can I have the same offers and pay the same prices? The customer support for UK napster is a sad joke. I have used the 'community' message boards and I suspect that the so-called uk support staff are just a few students who have been paid in beer to establish a presence on the boards but not actually provide any support. I have started playing a game called 'doubles' where I choose two songs from an artist I know and put them onto a playlist and then look at the recommendations for that artist to lead me to my next doubles selection. This selection method means that as well as listening to some old friends I also get the opportunity to dip my toes into some new artists that I wouldn't otherwise have experienced. This game relies on the "Recommendations" links to make it anything other than a random selection exercise. Well every now and then the Recommendations disappear from Napster. In July (2004) I have noticed this happening twice. 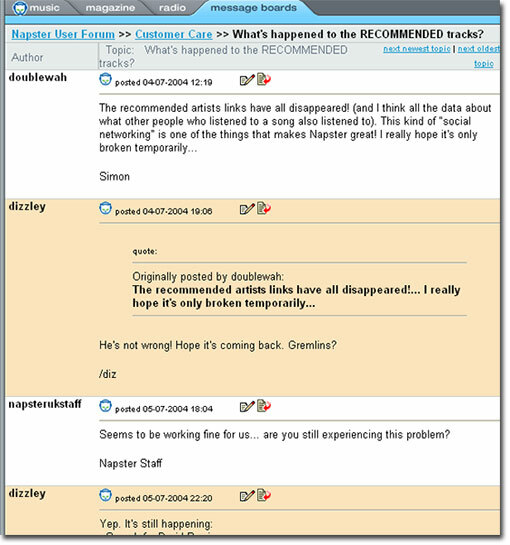 There has been no explanation from Napster and you can see the reponse from napsterukstaff in the screenshot below. "Seems to be working fine for us" - well that's OK then, as long as all is well in Santa Clara why waste time worrying about the colonies? American arrogance really gets on a lot of peoples nerves, Chris and Brad should realise that they can't get away with treating us as cash cows indefinitely. Here is some free advice for Chris and Brad: In the UK we don't have a season called "Fall", it's called "Autumn" ! It's a shame that you didn't do any usability testing with users from the UK as they would have told you about the Fall/Autumn issue. Although I suppose that I should be grateful you managed to display the dates in the correct dd/mm/yyyy format on the message boards. In addition, can you make your chart list consistent in it's display. 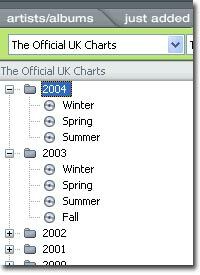 You have go the most recent year at the top of the list, but when you open the year folder you see the seasons displayed in the opposite order with the most recent season at the bottom. If you would like to spend a little bit of money on finding out about some of the other usability problems then contact me and I can recommend some people who can help you.